Analysis: After being extended a tender over the weekend, Wilson now officially re-ups with Cincinnati. 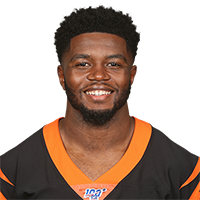 The third-year safety suited up for 16 games with the Bengals last season, notching 11 tackles (six solo) while playing primarily on special teams. Wilson sustained a chest injury during the final week of the regular season, and it remains unclear whether his recovery will interfere with offseason training. Analysis: Wilson was decent suiting up primarily on special teams in 2018, accumulating 11 tackles (five solo) in 16 games. The Houston product did suffer a chest injury in the final week of the regular season, so it's unclear whether he'll be ready for offseason training. Wilson is ruled out to return to Sunday's game against the Steelers due to a chest injury, Jay Morrison of The Athletic reports. Analysis: With Wilson unable to retake the field, Clayton Fejedelem will serve as Cincinnati's only healthy depth safety for the remainder of Sunday's season finale. There are no videos available for Brandon Wilson. Click here to view all videos.